Well, I collect anything that I likes the look of really. Mostly British, but any region or era. I have a preference for things local to my native West Yorkshire, but that said I still have quite a collection of GW and Southern locos. My main N Gauge layout is not based on anything in particular. I run what I like the look of, but I'm also adding a number of wagons from local companies. I have a mix of GWR, LNER and BR engines, both steam and diesel. My wagons are mostly Peco kits, although I do have some RTR stuff. I try to scratchbuild when I can. Usually when funds are low. One of my long term projects is building a Barclay 0-6-0 Tank that was operated by the Wemyss Private Railway in Fife. The donor chassis is a Grafar 0-6-0 General Purpose tank engine. The new body is being built from plasticard and brass tube. I am also building a US layout above my main layout. My 'train room' is an 8x6 shed in the garden. The main layout runs around the inside of all four walls and is 4ft off the floor. It is 20inches wide. The US layout is 8inches above the main one but only 9inches wide. It will have an upper and lower level track. The lower one will have a couple of sidings. It will have a mix of scenery and consist of mountains, tunnels, canyons, bridges, bridges and more bridges. I'll post some piccies one I figure out how. Close. Methil, by the cemetery. 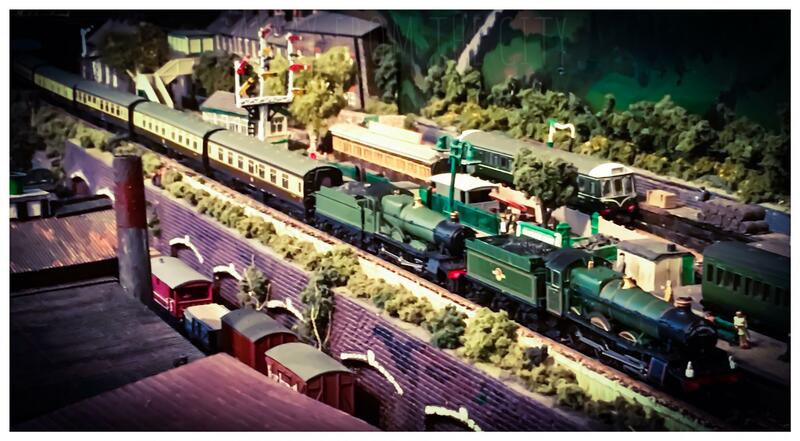 Nice to have an N Gauge neighbour. The cemetery is a stones throw from the River Leven and Methil dam. Hopefully there is a piccy of my WPR brake van and a couple of other models. 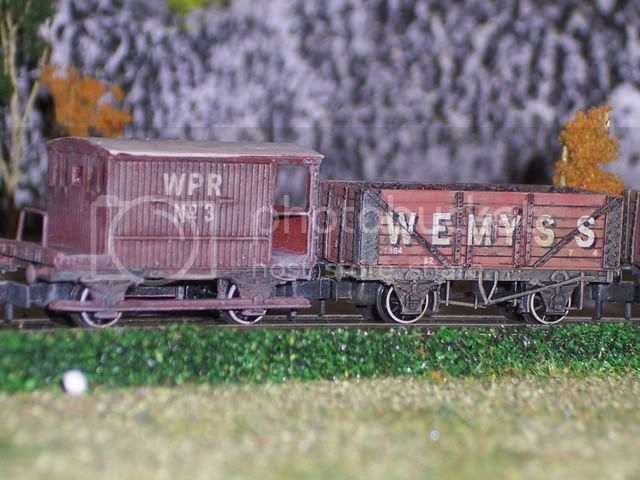 The NBR Floor Cloth Wagon was scratchbuilt using two Peco 10ft steel chassis and some plastic card. Nairns of Kirkcaldy used a few of these wagons to transport their linolium. The Coal truck uses a PG Models Bedford MK cab and chassis. The hopper body is built from plastic card. 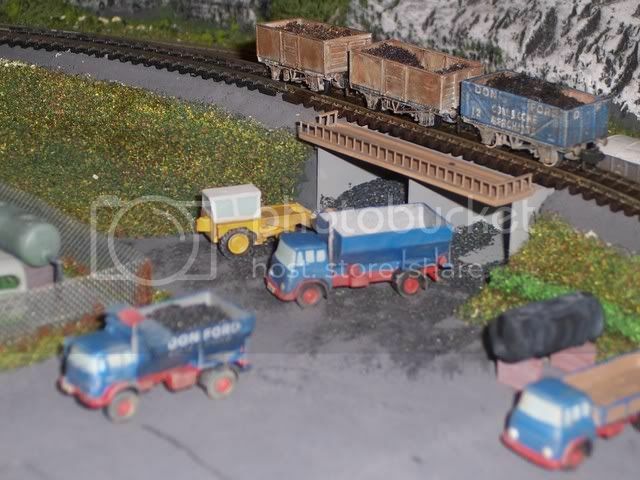 Last is a general view of my coal yard with another coal truck, this time a Fleetline Beford TK. An N Gauge neighbour? He must be very small! I'm modelling a fictional Cornish branch line (GWR) somewhere between Hayle and Perranporth in the late 50s/early 60s. I'm modelling somewhere north east-ish and hilly, roughly round 1955 - 1965. Some ex LNER to be seen, the odd foreigner too, just for fun. 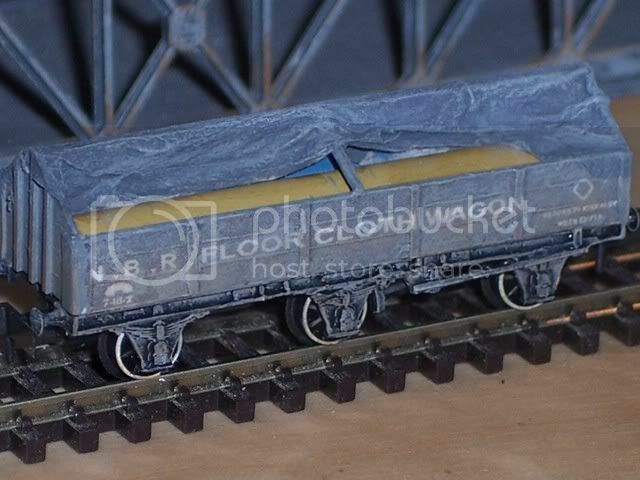 That said, I've just bought a BR blue class 04, so who knows where it will end up. Q) What are you modelling? 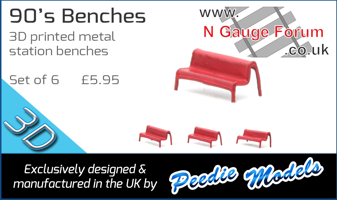 A) British N gauge railways. 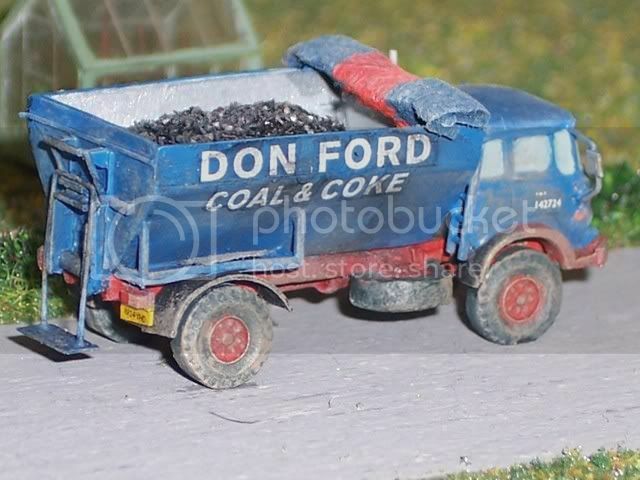 PS - That Don Ford coal lorry is nicely weathered and look very good; particularly the scratch build body (just a shame that the cab is a solid moulding). I'm (re-) modelling Pirmasens Nord slightly. (3) planning to remodel the junction at the west of the station (where the double track becomes two singles) to save length and allow longer trains to fit platforms 2 and 3. Waiting for a longer crossover to arrive courtesy of eBay. (4) lengthened island platform 3 and 4, and tidied it up a bit (still some non-matching platforms). Pimasens HBf also has an additional long siding, plus an additional very short siding in the brewery (my weekly beer train is now longer than all my run round facilities, so will now run in two portions). Thanks for the kind comments on my coal truck. It is a pity the cab is solid but hopefully some manufacturer will produce some decent models of trucks from the 60s-80s. I have a number of Dornaplas Thornycroft trucks and I noticed that they do a number of Ford cargo trucks, including one with just the chassis and cab. I may buy a couple and see what I can do with them. Well I gave all of my home made N Gauge creations to my Grandson and now model what I grew up with "British Steam", my layout is very loosely based on the Castleton and Monsal Dale area of Derbyshire with a name change to "Castletown and Monsal Vale Railway", it is a 10ft x 5ft model of a fictitious preserved railway, I decided on the Preserved railway theme because I like all British Steam and I can run whatever I like. Mid eighties to late nineties so i can cover BR blue through to sectorisation, i currently run BR blue and early railfreight liveries on Saneham-Tey, am also planning my own layout of East Suffolk Jc in Ipswich, this will be late eighties and early nineties only, plenty of livery variation on classes 31,37 and 47 with the odd 56 for added interest.